Hi Dealsnloot Readers,Honor Loot Offer Honor Bee Mobile at just Re 1. 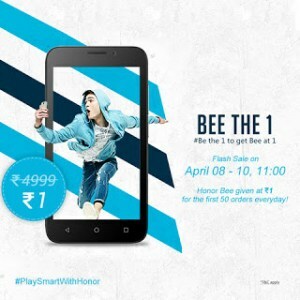 HThe well known brand “HONOR” is offering Honor Bee Smartphone at Rs.1 only. The market price of This phone is Rs. 4999. This offer is valid for first 50 users everyday from 8th to 10th April at 11:00 AM.” .HONOR BEE 1,HONOR BEE offer,HONOR BEE specification,HONOR BEE price,HONOR BEE review,HONOR BEE loot.This promotional event is based on a first-come, first-served basis. So what are you waiting for?? Rush and get your mobile for Rs. 1 on the event dates. BEE THE 1 #Be the 1 to get Bee at 1.So Grab This Loot Script Trick. Note: Only First 50 Orders At Rs 1, So It'll be Huge Rush.So Try Ur Luck. 1 . Go To Registration page from here and register For this sale. 2:- Now verify your email. Great !!!! you got Rs. 2000 coupon in your email inbox. 3. Now Go To sale page (11 AM on 10th April). 4. Add product to cart fast and checkout. 5. Now go to cart and Make the payment of Re.1. Hello people I'm providing a common java script which is used to click on button every 10 milliseconds, so try out this script in a tab and also do manually click on another tab. As me too not yet tried, just give it a try.. Nothing to loose.. copy below paste and paste it into console..
How to Use Script ? Select Last Option, "Inspect Element"
That's It, Now Wait and Watch. The Honor Bee Rush Buy promotional event will commence on 8th-10th April 2016 everyday at 11:00 am and the same is being conducted by Vision Distribution Pvt. Ltd. ("Vision").